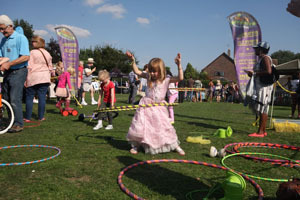 Circus Workshops and circus skills for schools, management training, team building, and corporate fun days, fetes and carnivals. 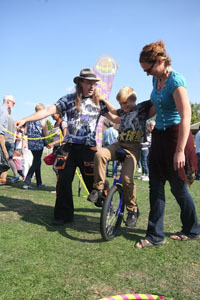 Learning to juggle and circus workshops are the perfect tool for teaching people to believe they can do the impossible... It's also a lot of fun and great having circus workshops at a party. How ever old you are. ...It seems only fair considering that most jobs these days expect us to do the impossible at least six times before lunch...that we should get a little training. ...and that it should be fun. 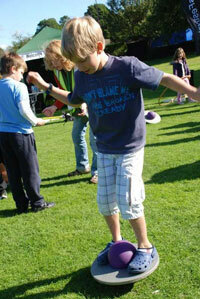 The benefits of circus workshops are so numerous we've created an extra page just to list them all. Learning to do the impossible is of course, not easy. Some might go as far as to say that performing impossible feats is actually quite hard. That's where we come in. As people who defy gravity on a daily basis, We can pass on the experience of having taught literally thousands the easy ways to do impossible things. Our experience ranges from working with the BBC as part of their 'Surprise Yourself' event, teaching workshops at circus festivals, teaching in schools and for children's organisations. Teaching teachers (yes they do behave worse than the children). Teaching groups of accountants (the collective noun for accountants is actually a 'circus of accountants' due to the amount of juggling involved), as well as numerous company away days, and management training programs. 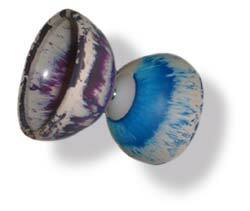 "I love the look in people's eyes when they suddenly realise they can, and are juggling. They usually drop a fraction of a second afterwards because they're so shocked they're actually doing it. Half the trick is getting over the shock that you're capable of doing these things." 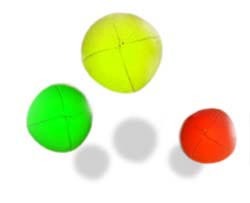 We can teach how to juggle balls, and juggling clubs. How to spin plates and dabble with diabalos. How to get a little bit devilish with devil sticks, or to play with poi. How to slide a crystal ball round your hands like David Bowie in labyrinth (contact juggling)... or for that matter, how to balance a chair on your chin. Since first writing this, the list of circus skill equipment has expanded to include, balance beams, chinese ribbons, stilts, pedal-gos, unicycles, and balancing feathers, and we're always looking to expand the range of what is offered. The most recent addition, is some very wonderful profession quality hula hoops. If there's anything you specifically would like to learn, let us know, and we'll see if we can help, or put you in touch with someone else who can. We have CRB clearance and Public Liability Insurance for all our circus workshops. please contact us. When working with children we do require that at least one other adult is present at all times to deal with anything serious that might prevent us all from having lots of fun. You should also ensure that there's somewhere we can play if it's wet, as we require paying even if it rains. 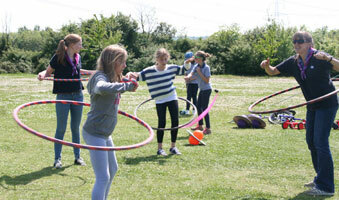 Do you do circus workshops for children/adults/OAP/Special Needs? What's the youngest children you can cater for? How many people can you have in a circus workshop? How long are your circus workshops? What format do your circus workshops take? How should we dress, are there clothing requirements? I've other questions - how can I contact you? Yes. We can happily work with all the above. If you've got a specific group that you want to know if we can help with, contact us, and we'll see what we can do. We have a guideline that we don't do parties for children under seven, because they generally require a little too much individual attention. For small groups, we may make exceptions. The youngest person I've ever taught to diabolo was three. In a mixed group there is no problem with younger people being around as long as there are responsible adults to look after them. It depends on the type of workshop. For a drop in workshop there isn't really a set number, and it's more down to the amount and type of space available as to how many we can fit in and look after at a time. For parties and more formal workshops, as a guideline, we say that twenty people is about right for one instructor. If there are more, it means that people don't get as much one to one help, but it's not generally a problem. We can of course, provide more instructors. There are also different styles of workshop that are better suited for different amounts of people, so contact us, and we'll see what we can do to help. If dealing with larger numbers of children, if you have volunteers who can assist, that does cut the number of workshop leaders we need. The shortest we've done was one hour, and the longest was five days. Normally workshops run from a few hours to an afternoon. Some people like to have formal lessons, where everyone has a go at the same thing at the same time, and the tutor gives formal instructions. This can be good for school type situations or for teamwork exercises where everyone can help everyone else learn as they learn. Some situation lend themselves towards a more informal structure, or what are often called 'drop in sessions' where the equipment is made available, and people are allowed to try it out as and how they wish. The tutor will generally be on hand if there are any questions, or if people require demonstrations of how to use things. This tends to lend itself more to fetes and parties, where not everyone is going to be around for the whole workshop. You can of course run a combination of the two, where people are given some instruction on all circus skills at the start, and then allowed free reign. 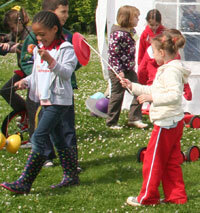 We'll more than happily advise you what circus skills and format will fit best with your event. For fetes and similar events, the simple answer is that an area around 15m x 10m is ideal. However, we've run very successful workshops with a fraction of that amount of space. Obviously, if there are only 10 people in the workshop, we use less space than if there are 30. It depends on how many people you have at your event, and how many workshop leaders we're bringing. It also helps if the area is flat ... and for safety purposes, free of holes or anything anyone can fall over. If you're planning an event and you need some advice, feel free to ask us about this. The basic advice is however, the more space the better, within reason; We don't need a football pitch for ten people, but anything less than a few metres squared per person can get a bit cramped, especially if people need the additional space for unicycles and hula hoops. Regarding suitable clothing, there's no huge restrictions, Some people like to wear fancy dress and we have no problem with that. Obviously it takes more talent to walk on stilts in high heels than it does normal shoes or trainers, but the last thing a circus can recommend is sensible footwear, so I just say that if you want to turn up in high heels, you're going to find some things significantly more difficult, and quite a bit more dangerous. The same arguments go for capes and huge flowing skirts. We often add new equipment to the list. If there's anything you're particularly interested in that's not listed, please drop us an email and ask. 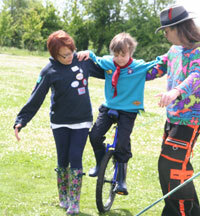 Many circus toys such as stilts and unicycles contain an element of risk. This is part of their attraction. However, that risk is significantly increased if the area being used is not kept clear and tidy. Whilst teaching, we can't be tidying too, so we ask that you please help us to keep the area tidier, and hence safer. 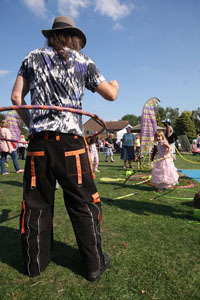 If you allocate a volunteer who's sole responsibility is to keep the area tidy, then it means we can concentrate on helping people with circus skills, rather than spending our time keeping the area tidy and hence safer. For children's workshops and parties, obviously we can help to keep everything safer, by having more responsible adults on hand, and we don't complain if they join in and play too.